Healthy Life Seminar: Wisdom Teeth – Not That Wise! 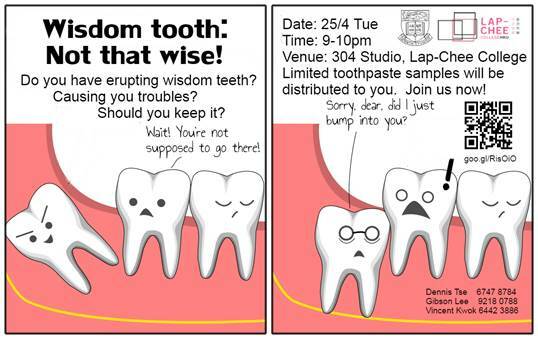 Would you like to know more about your wisdom tooth? Do all wisdom teeth require removal? What happens if you leave it alone? Fellow dental students from the college cordially invite you to participate in a presentation about the introduction of wisdom teeth, when it requires removal, when removal of wisdom teeth is required, and other topics. Not least, souvenirs will be distributed to the participants (first 20). We acknowledge that many fellow students would have consulted dentists and have been suggested for the removal of wisdom teeth extraction. Many may have spent a lot of time thinking whether or not they need to have it removed due to fear of the procedure, cost of the procedure, and complications of the procedure. A lot of your intelligent questions will be addressed during this seminar by our friendly fellow dental students!